The core of many Anglican services is Holy Communion, also known as the Eucharist or The Lord’s Supper. This is a ceremony derived from the supper which Jesus held with his followers on the night before his arrest and execution (sometimes called the Last Supper). Christians believe that this ceremony creates a special sort of contact with God, which helps to strengthen us as Christians. What actually happens at Holy Communion? Holy Communion involves the giving out of bread and wine which has been consecrated, or made holy, with special prayers. In most Church of Ireland parishes real bread is used, other churches use special wafers. Normally members of the congregation walk up to the front of the church and kneel, receiving the bread and wine (for Anglicans usually receive both during communion) from the priest in cupped hands. The chalice, the ceremonial cup containing the wine, is sometimes given by an assistant. Won’t I catch horrible diseases from sharing a cup? Probably not, as alcohol is a disinfectant and the rim of the chalice is usually wiped between uses. If you are concerned, you can hang on to the bread and either dip this into the wine yourself or let the priest do it for you instead of drinking directly from the cup. Does anything weird happen when you receive Communion? Mostly, no. People do have mystical experiences, but they are not a normal part of Holy Communion in most churches. (Some branches of Christianity actively encourage them; a lot of the Anglican Communion tends to be suspicious of this sort of thing!) In general, Holy Communion strengthens your relationship with God in the same way as you can get to know people well by spending a lot of time with them over many years. Can anyone take part in this ceremony? Officially, you have to be baptised in order to receive Holy Communion. It doesn’t have to be an Anglican baptism, any branch of the Christian Church will do. Many churches (including St. Peter’s) will have a notice to this effect on their Sunday service sheets or the priest will announce it during the service. The ceremony of Confirmation (a deliberate reaffirmation of the vows of baptism, made when we’re old enough to know what we’re doing) still exists in the Anglican Communion, and some Churches require you to go through this process before you can receive Holy Communion. Will I go to Hell if I don’t receive Communion regularly? We sincerely hope not! Holy Communion, like most of the Church’s activities, is a means to an end rather than an end in itself. However, the Anglican Communion believes that Holy Communion is a valuable component of our relationship with God. 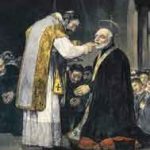 Do I have to be particularly holy (“pure”) in order to receive Communion ? Again we sincerely hope not! Holy Communion is not a reward for being good. Rather it is part of the healing process which helps to make us well in the sense of being in a right relationship with God, with one another and within ourselves. What else happens in a church service? Anglican services are extremely varied and flexible. Set forms of words are available, in the Book of Common Prayer. But there is much variation in style between individual parishes, and some parishes use different services on different Sundays. There are specific words to accompany Holy Communion, and the Lord’s Prayer will normally find its way into a service. There will often be a Creed, a formal statement of basic Christian beliefs. Most services include hymns, which may be either traditional or modern. There will be prayers – some of these will be in set words, but we also pray about current issues. Services also include readings from the Bible. Quite often. We’re fully aware that sermons have a reputation for inducing sleep. This doesn’t have to be the case. 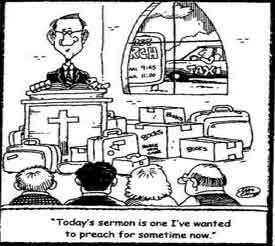 Some preachers are very good speakers, adept at making Christianity relevant to everyday life. But there’s an old joke which says that if everyone who fell asleep during the sermon were laid end-to-end – they’d be a lot more comfortable! Yes, we admit it. There will normally be a collection. We need to meet running costs and pay salaries, and the Anglican Communion is also a major social service organisation. No one will pay attention to how much you’re dropping in the basket, and you don’t have to make a contribution at all. If you see any value in what we’re doing, you’ll probably want to help if you can. Why do priests wear funny clothes? Like many of the details of our worship, this is a historical accident. A priest’s robes are based roughly on the garments worn by Roman officials in the early days of the Church. We’ve added Christian symbols to them, but (being Anglicans) we haven’t actually changed anything much. So what is the Anglican Communion?